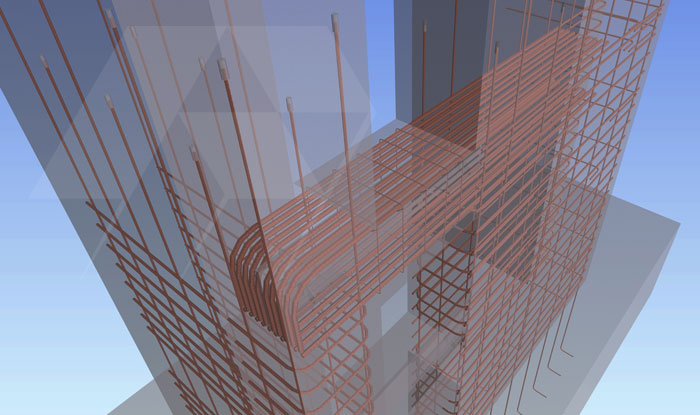 3D rebar BIM models with shop drawings and bending schedules. We have combined our considerable experience and abilities in both the 3D modeling of building structures and the detailing of reinforcement bars for concrete to be able to lead the field in this new and exciting method of detailing concrete reinforcement. 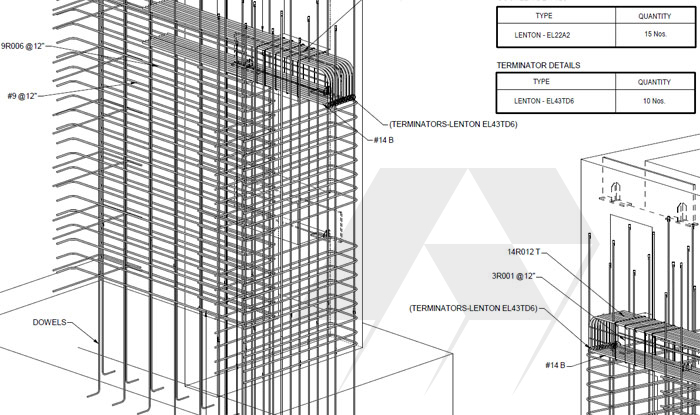 Detailing reinforcement in 3D offers significant advantages over the 2D process. Not only is it faster, modeling rebar in a 3D environment essentially eliminates clashes, as you can instantly see as you model when the bars will not fit into the respective area. Reinforcement can be reviewed in detail as an accurate digital representation before it is ordered from the fabricator and complex cages can even be assembled off site. 2D drawings and bending schedules are still produced and issued but we also issue a 3D model to all members of the team from the Contractor and consulting Engineer down to the steel fixers on site. Site personnel find this very useful where congestion of reinforcement or site restrictions would not normally be discovered until the reinforcement is on site and being fixed. The 3D model shows every single bar in the exact position it should be fixed as well as any existing obstructions etc. The rebar fabricator can take data directly from the model to its machinery rather than relying on manual input from paper schedules. Concrete pours can be defined in the model along with instant volumes and quantities, ensuring more accurate management of material deliveries with much greater control, which in turn minimises waste and reduces costs. All concrete profiles and details, embeds, reinforcing bars, anchor bolts, formwork components and even critical site set-out points can be modeled quickly and precisely in preconstruction, ensuring that everything fits when construction begins. Having a central data-rich model means that every output, be it a drawing, report or schedule, is consistent between each discipline and the work involving processing information only needs doing once. The benefits of having a detailed digital model do not stop at the engineering and detailing phase. With the reinforcement fully modeled in 3D, the contractor can be sure that it will fit when the time comes to fix on site. Data from the model can then be passed to the field, allowing contractors to perform model-based layout using robotic total station devices and also track rebar and materials, identifying where and when they are required. On site, the fixers can take a look at the rebar in the model environment, giving them an instant and clear appreciation of what is required, rather than relying on interpreting traditional 2D drawings. 3D detailing provides considerable added value to our clients by introducing facilities such as clash detection and on site 3D model interrogation.